We’ve been following the special election for Georgia’s sixth Congressional District. Vacated by Rep. Tom Price when he left to serve as HHS Secretary, the race has drawn national attention. GA-6 is Newt Gingrich’s old district and has been in Republican hands since 1979. For better or worse, Democrats have pitched the race as a referendum on President Trump’s agenda. GA-6 though was not a die-hard Trump district in the 2016 election. Trump only won by 1.5 points as most of the district’s voters chose Rubio in the Republican primary. But so desperate are Democrats to find a mandate to oppose Trump, this is the route they’ve chosen. Ridiculous amounts of money have been dumped into this race, which has seen ranking party officials and Hollywood types stumping for candidates on both sides. Polling has consistently shown the race is in a dead heat, with any variation falling in the margin of error. Both sides are nervously hedging their bets, awaiting tonight’s outcome, though Democrats seem to be the more nervous of the two. Polls close at 7:00 PM EDT with two polling locations open until 7:30 EDT. We’ll be updating this post as news requires, so be sure to refresh often for the latest. You’ll find the most recent updates up top. Spend $30 million on a race. And so has NBC, so we’ll call it too — HANDEL WINS! CNN projects Republican Karen Handel wins the special Congressional election in the Georgia 6th, beating Democrat Jon Ossoff. Jon Ossoff came to my mosque Friday. He didnt try to win our vote, he just had a professional camera crew taking pics of him with hijabis. Montana’s at-large election on May 25 set the all-time record for votes cast in a stand-alone House special election at 381,416 — but that’s a result not only of high interest but the state’s size: There are roughly 781,000 eligible voters in Montana, compared to about 465,000 in Georgia 6. If even 230,000 people vote in Georgia 6, turnout there would exceed Montana’s. When’s the last time turnout for a stand-alone House special election was above 50 percent of eligible voters? I’ve scoured a lengthy list of such elections over the last century and can’t find a single example. EDT, not EST. We are in Daylight Saving Time. I share your peeve. Folks, to make it easier, just use ET, CT, etc. Now hang on a minute there. Only two months ago the media was assuring us that Ossoff was 20 points ahead and the Republican had no chance – just like when Trump was running for president. For months the media has been touting this election as a referendum on Trump. As usual, they start backpedaling as the election gets closer. I expect Handel to win by a landslide. I would LOVE to pull up the thread on the day of the original election a few weeks back. And what were the numbers again tonight?? Heh! But I’m not a great prognosticator, just a decent observer, and as I said this happens in EVERY jungle primary in the South! (Happens in Louisiana all the time) The fools are those “great commentators” who ignored this painfully obvious Truth. And as an added bonus – all that big money dumped into this district did NOTHING!!! It was all WASTED! The Result was the same result that Any Fool could predict with mathematical accuracy 6 weeks ago – and This Fool Did! With over $50 million spent on this loss, I’m still laughing my Ossof over it. 65% in at 9:45 ET, and it’s Handel 53%, Ossoff 47%. Yeah, I’m getting tired of all the winning! You think any reporter will call this election a referendum on Trump again? By this point, we’re waiting for DeKalb County and mail-ins, but Handel is up by >6%. DeKalb. Knew it. Don’t trust DeKalb. Alternative headline: Georgia just says NO to California liberals! The Republican won in SC, too. LOL! Let’s give thanks for the victory. 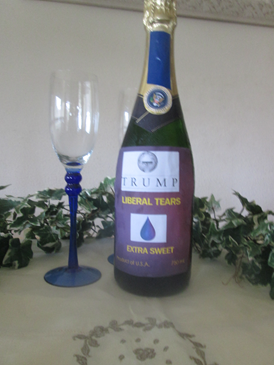 I think Eric Trump runs the winery business now, send that to him. I’d love to see this on my store shelves next year! Pollsters hardest hit, right after the prog party, but then I repeat myself. Spend $30 million on a race. Lose. So, how much is that for each vote he received? LOL, the progs can’t buy a win. Ossoff was the obama of congressional candidates.